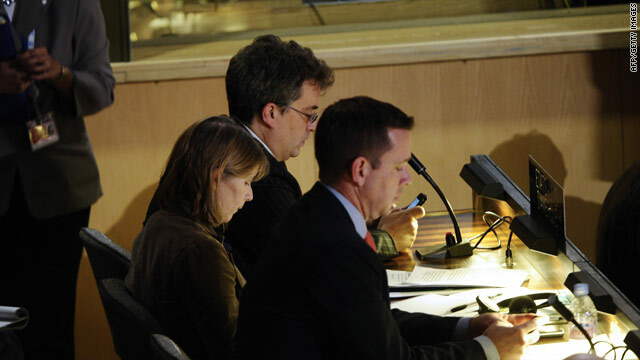 U.S. delegation at the UNESCO proceedings. Editor's Note: Former U.S. Senator Timothy Wirth is President of the United Nations Foundation. As the eyes of the world are focused on the Palestinian statehood bid at the United Nations in New York, another troubling chapter is unfolding in Paris. The United States is on the brink of abandoning its decades-long leadership in several international organizations – a process that will fundamentally undermine American national security and economic interests. At issue are two laws from the early 1990s that prohibit the United States from providing financial contributions to any United Nations entity that admits Palestine as a member. The laws are strict: if Palestine is admitted to a U.N. agency, the United States must stop paying its membership dues. The restrictions provide no authority for the president to waive these prohibitions even if it is in the national interest to do so. With a clear majority of countries around the world prepared to back Palestinian ambitions at the United Nations, the United States is poised to lose its leverage over several U.N. bodies that advance American interests and promote our ideals. The damage to Americans of a forced withdrawal would not stop there. The first U.N. agency from which the United States could be pushed out is UNESCO, which admitted Palestine as a member today. To Americans, UNESCO is best known for designating World Heritage Sites. It also leads global efforts to bring clean water to the poor, promotes educational and curriculum building in the developing world, and manages a tsunami early warning system in the Pacific, among other important tasks. This critical work would be jeopardized if UNESCO’s top funder stops paying its bills. Read: When social entrepreneurship and news collide. The immediate damage would not be limited to UNESCO. The moment Palestine is admitted to UNESCO it will also clear the path for its entry to the World Intellectual Property Organization. This is a lesser known U.N. agency that serves American businesses and brands by setting global standards for copyrights and adjudicating cross border patent disputes. In the last year alone, dozens of major American companies brought cases before WIPO — the American Automobile Association, Apple, The North Face, Costco and Facebook to name just a few. If Palestine joins WIPO, the United States will have to pull out, limiting its ability to steer policies in ways that advance American economic interests and create jobs here at home. Read: What does 7 billion mean? The damage would not stop there. The membership of U.N. agencies like the International Civil Aviation Organization, International Postal Union, and the International Telecommunications Union are also likely to admit Palestine. Each of these agencies performs tasks that American lawmakers probably take for granted. Thanks to the Universal Postal Union, the Chinese will deliver a package with American postage stamps on it and vice versa. Air traffic controllers in Dubai and Dulles speak the same language because of the International Civil Aviation Organization. Alas, under the 1990s laws, the USA will lose its voice at those organizations once they admit Palestine. Without the United States as a voting participant, perhaps French supplants English as common language of international aviation? Next on the list of agencies from which the USA would be forced to withdraw is the International Atomic Energy Agency and the World Health Organization. In recent years the IAEA has been a critical part of American attempts to constrain the nuclear ambitions of Iran and North Korea. In 2006, the Bush administration successfully lobbied other members of the IAEA executive board to refer Iran’s nuclear program to the Security Council for sanctions. Should the United States stop paying membership dues to the IAEA–which it could be forced to do under current legislation if Palestine is admitted as a member — the United States would give up our vote on the executive board. It would literally lose a seat at the table during the next nuclear crisis. The WHO works closely with the United States–particularly the Centers for Disease Control and Prevention — to keep infectious diseases like the Avian Flu from reaching our shores. If the Palestinians are admitted to the WHO, that cooperation would have to stop under the current law. Read: New Security Council takes shape. Should the U.S. pull out of these organizations; it is not as if these organizations would stop functioning altogether. Rather, an agency like IAEA may have to reduce the number of nuclear inspectors it deploys around the world. Other countries, maybe even America’s global rivals, will step into fill the leadership void left by the United States. As long as these laws remain on the books, Congress is setting the stage for America’s waning influence over international affairs. From businesses interests to non-governmental organizations who care about America’s influence at the U.N., everyone must take a stand and urge Congress to give the President the flexible authority needed protect our national security and economic interests. The views expressed in this article are solely those of Timothy Worth. For more views on the United Nations, visit U.N. Dispatch. Explain how the WIPO creates jobs in America?? Anti-semitism????? Not at all!!! There are jewish all around the world! the problem is with Israel and not with the entire jewish!!!! I support Palestine because they just want to be freed!!! You are talking about terrorism but USA have committed the worst crimes in te world (Irak, Afghanistan, Guantanamo, Vietnam)!!! Palestinians don't care about USA. USA is not the center of the world! We don't care about you and we don't want to kill you. You are very straight-minded and once more USA show us that they don't want peace !!!! The real definition of Semitic people is "those indigenous to the land" (Palestinian Muslims, Christians and Jews), and those who speak a language derived directly from ancient Aramaic (Arabic and ancient Hebrew) " The Israeli Zionists are NOT Semitic people because they are European and American, many of them converts. Zionists speak a modern version of Hebrew (without the hyphen), while Palestinian Jews speak the Semitic ancient Hebrew. Now, the global giant will have to choose which side he is on, The long standing friend or the world community. I can't wait to see the outcome. For all those talking of anti-Semitic voting and supporting UNESCO is tantamount to betraying Israel, Don't you find it interesting that Israel has NOT withdrawn it's funding to UNESCO. Makes the US reaction look more like a bully boy with wounded pride rather than the defender of their smaller friend. Stop feeding UN thieves. Divert money to US economy. Stop feeding palestinian thugs killing Americans on regular basis for decades. In economics, there is what you point of elasticity. America is over stretched with too much legislation that were made to subjugate, dominate terrify and force other nations to do the American bidding. These Laws are now turning against America to the advantage of advancing nations like China. I think time is counting against American hegemony and i think America should honourably leave the stage for nations like China when the OVATION is still loud. In economics, there is what you call point of elasticity. America is over stretched with too much legislation that were made to subjugate, dominate terrify and force other nations to do the American bidding. These Laws are now turning against America to the advantage of advancing nations like China. I think time is counting against American hegemony and i think America should honourably leave the stage for nations like China when the OVATION is still loud.